This super trick, one belt drive system runs off a standard rotation 1969 or later water pump. Using this serpentine design will totally eliminate any belt throwing and enhance your engine compartment. March Performance CNC machines each part from solid 6061-T6 billet aluminum for extra strength and wear. 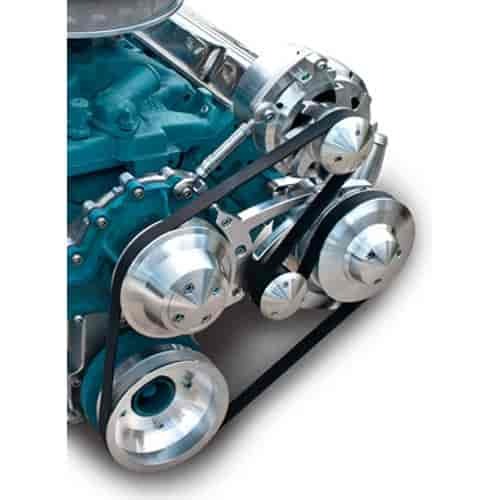 To get belt tensioning perfect, stainless steel rods with chrome moly ends are used. To eliminate polishing in those hard to reach places all parts are covered with maintenance-free clear powdercoat. Gates K060658 - Micro v belts 66 3/8"